The “Journey to Star Wars: The Force Awakens” has unleashed a number of books which serve several roles: those which fill in the gap that exists between Return of the Jedi and The Force Awakens, those which fill in gaps between A New Hope through to Return of the Jedi, and those which fill in the gap between Revenge of the Sith and A New Hope. It’s a growing wave of novels, slowly overriding everything which had previously come before in the now defunct “Legends” universe. Star Wars: Lost Stars takes place in all three. Lost Stars, by Claudia Gray, is a well written romance between two childhood friends from opposite sides of the galactic tracks on the Outer Rim planet Jelucan. It falls in the Young Adult category, and while the print is somewhat larger than your usual novel and the space between lines a bit wide, it is just as well written as anything found in the regular fiction section. It’s also one of the most enjoyable new Star Wars reads we have the pleasure to proceed from cover to cover (granted, our list is not a very long one!). The characters are well developed and the pacing of events balanced throughout the story. But, perhaps, the most powerful element Lost Stars brings to the page is a prolific attack on the nostalgia of any reader familiar with the Original Trilogy. To explain this, let’s go into the plot briefly. On the planet Jelucan, we learn that society is divided between the haves and the have nots. The latter are the original settlers of the planet, political refugees with an ingrained sense of honor, who dwell in the valleys of the mountainous planet with little more than that honor to their name. The former are more recent arrivals (generationally speaking) who found homes on the mountains and promptly began mining them, making substantial wealth in the process. Our story begins with a chance encounter between a girl from the valley people, Ciena Ree, and a boy from the mountain people, Thane Kyrell, drawn by personal passions for all things that fly to a personal shuttle of Grand Moff Tarkin. Tarkin appears approximately twice in the book, fleetingly so, and in this instance, it’s at the beginning of the Empire as Jelucan is incorporated into it. Thane and Ciena are inspired to start training together to make it into a prestigious Imperial academy, one of the few places where one can get a job to fly the craft they admire. The book then begins to skip through time with Ciena and Thane building a strong friendship and a nearly unbreakable bond as they learn to fly together. Eventually, they make it into an academy, the academy, on Coruscant. There the two begin to experience a different Empire than the virtuous one they had grown up believing in. What’s important about their development, as they grow older, they transition from seeing the Empire as the Empire wants its citizens to see it, to seeing it for the actions it takes to retain its control over the galaxy. Ultimately, this will result in the two finding themselves on either side of the Galactic Civil War. Likewise, as they grow older, their friendship evolves into a romantic one, which sets the drama of their placement within the ranks of the Empire and the Rebellion. And here is when the nostalgia kicks in, grabs the reader by the shirt, and holds you captured in delight as the two would be lovers find themselves falling incidentally as spectators and minor participants in the major events of the Original Trilogy. Thane is assigned to the Death Star and only just misses being killed when a Tatooine farm boy drops a torpedo down an exhaust shaft. Ciena is given the task of piloting the shuttle which rescues Darth Vader, stranded in the debris field of a ruined battle station. She’s assigned to disable the Millennium Falcon’s hyperdrive while it’s parked on a landing pad at Cloud City, and he’s piloting one of the snow speeders on Hoth, using his knowledge from an Imperial education to find out the weak spot on an AT-AT. It’s a disservice to say that all that is enjoyable about Lost Stars boils down to grinning when one watches the characters interact and react to events of the three movies, because the characters are well crafted and their own personal stories, which tumble along affected by the bigger events, are in themselves, interesting and engaging. Through their eyes, we get a good representation of the struggle of individuals to cope with loss, be it a friend on the Death Star or an entire planet, destroyed by said Death Star. How characters react and why adds an additional layer of storytelling. In this manner, the reader finds themselves before Star Wars and then, in an exhilarating victory for the Rebels, in the brief quiet interlude that followed the destruction of the Second Death Star. In a heart beat, we find ourselves in that first wave of efforts to fill in the what ifs following Jedi. This ultimately leads to the Battle of Jakku, an event which is history in the time of The Force Awakens. In the trailer for The Force Awakens, we see ruined Imperial ships crashed into the planet’s sandy surface. These are the legacy of that battle, which serves as the novel’s finale, and an ultimate Rebel victory which forced remnants of the Empire into signing a treaty of surrender. Through it all, are Ciena and Thane, and their story, joined to our own experiences following the adventures of our heroes from the Original Trilogy, and together forming a fun, entertaining and engaging read. 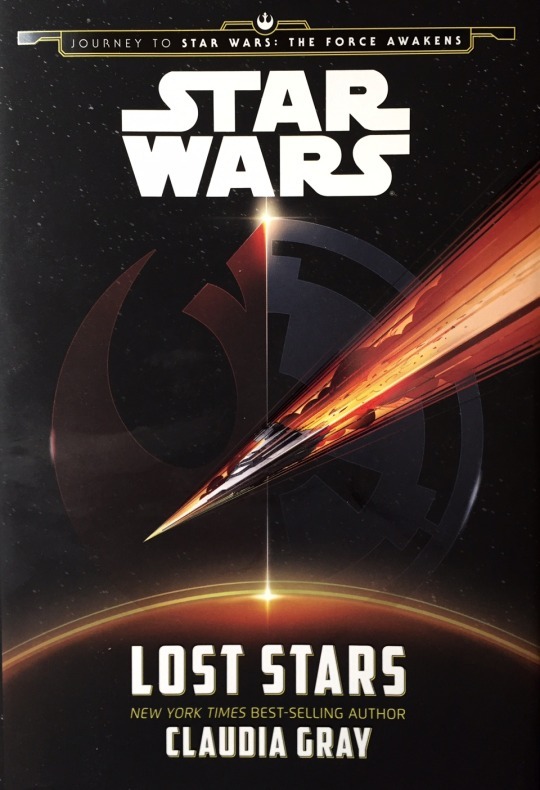 Star Wars: Lost Stars is worth picking up for every Star Wars fan interested in the expanded universe, and also, for anyone interested in a good old fashion romance.